Location of the Collectivity of St Martin in the Leeward Islands. b. Assigned but not in use. c. Shared with Guadeloupe and Saint Barthélemy. The official flag of Saint Martin is the flag of France. The unofficial flag, consisting of the island's logo on a white field, is shown below. }}: Saint-Martin), officially the Collectivity of Saint Martin (French: Collectivité de Saint-Martin) is an overseas collectivity of France located in the Caribbean. 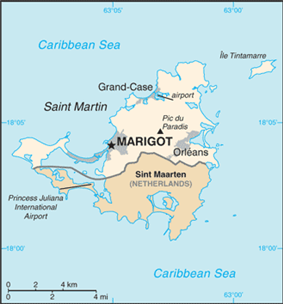 It came into being on 15 July 2007,[note 1] encompassing the northern 60% of Saint Martin island and neighbouring islets, the largest of which is Île Tintamarre. The southern 40% of the island, Sint Maarten, is one of the four constituent countries that form the Kingdom of the Netherlands. Its capital is Marigot. It has a population of 36,286 (as of Jan. 2011) on 53.2 square kilometres (20.5 sq mi). It is separated from the island of Anguilla by the Anguilla Channel. Saint Martin was for many years a French commune, forming part of Guadeloupe, which is an overseas région and département of France. In 2003 the population of the French part of the island voted in favour of secession from Guadeloupe in order to form a separate overseas collectivity (COM) of France. 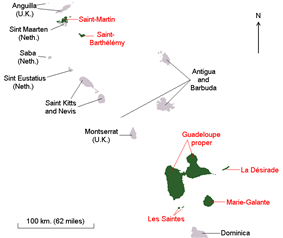 On 9 February 2007, the French Parliament passed a bill granting COM status to both the French part of Saint Martin and (separately) the neighbouring Saint Barthélemy. The new status took effect once the local assembly was elected on 15 February 2007. Saint Martin remains part of the European Union. }}: Conseil territorial) and the election of Louis-Constant Fleming as president of the Territorial Council. On 25 July 2008 Fleming resigned after being sanctioned by the Conseil d'État for one year over problems with his 2007 election campaign. On 7 August, Frantz Gumbs was elected as President of the Territorial Council. However, his election was declared invalid on 10 April 2009 and Daniel Gibbs appointed as Acting President of the Territorial Council on 14 April 2009. Gumbs was reelected on 5 May 2009. 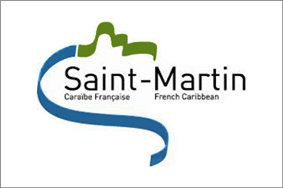 Before 2007, Saint Martin was coded as GP (Guadeloupe) in ISO 3166-1. In October 2007, it received the ISO 3166-1 code MF (alpha-2 code), MAF (alpha-3 code), and 663 (numeric code). The coat of arms of the French overseas collectivity Saint-Martin features a ship, a palm and a sun, and reads "Collectivité de Saint Martin". The comune that existed until 22 February 2007, used similar arms but with the legend "Ville de Saint Martin". The French part of the island has a land area of 53.2 square kilometres (20.5 sq mi). A local English-based dialect is spoken in informal situations on both the French and Dutch sides of the island. At the January 2011 French census, the population in the French part of the island was 36,286 (up from only 8,072 inhabitants at the 1982 census), which means a population density of 682 inhabitants per square kilometre (1,770/sq mi) in 2011. 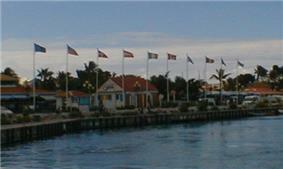 Flags flying in Marigot harbour, Saint-Martin. The official currency of Saint Martin is the euro, though the US dollar is also widely accepted. Tourism is the main economic activity. INSEE estimated that the total GDP of Saint Martin amounted to 421 million euros in 1999 (US$449 million at 1999 exchanges rates; US$599 million at Oct. 2007 exchange rates). In that same year the GDP per capita of Saint Martin was 14,500 euros (US$15,500 at 1999 exchanges rates; US$20,600 at Oct. 2007 exchange rates), which was 39% lower than the average GDP per capita of metropolitan France in 1999. In comparison, the GDP per capita on the Dutch side of the island, Sint Maarten, was 14,430 euros in 2004. Map showing the former constituent parts of the Guadeloupe region/department among the Leeward Islands, including Saint-Martin, before February 2007. ^ The French law was passed in February 2007, but the new status only came in force once the local assemblies were elected, with the second leg of the vote ultimately occurring on 15 July 2007. See J. P. Thiellay, Droit des outre-mers, Paris:Dalloz, 2007. ^ The Treaty of Lisbon states that Saint-Martin is a part of the EU. See: . ^ This "local" variant of the flag is listed as "dubious" at the Flags of the World website. ^ Total 2004 GDP of Sint Maarten () divided by the number of inhabitants in 2004 (), then converted from Netherlands Antillean gulden to euro by using the 2004 exchange rate.